Kristin Elizabeth Clark, October 2013. This novel in verse is told from three points of view: Brendan, the protagonist, is a straight boy who is starting to wish he were a girl. Vanessa is his girlfriend, who’s stopped hanging out with anyone but Brendan and doesn’t have a shoulder left to cry on when this news comes out. Angel works at the local LGBTQ center and meets Brendan on a bus. This is a fairly typical problem novel with a few special features, like the verse, the triple narration, and the introduction of gender fluidity, a concept many teens might not know about. But the plot arc fits the formula; Brendan realizes he’s different, freaks out, vows not to tell anyone, explores his new world, and slowly accepts who he’s become. That said, the book is accessible and appealing, fast-paced for a character-driven novel, and mixes the familiar with the mysterious. Recommended. 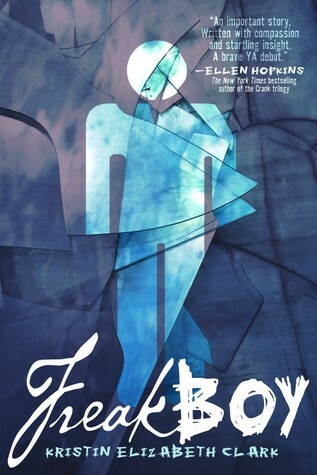 This entry was posted in 2013, gay male, genderqueer, high school, Kristin Elizabeth Clark, novel in verse, problem novel, prostitution, queer protagonist, realistic, secondary queer character, sexual violence, trans. Bookmark the permalink.